The Angry Connor performs just like Archer a tank yet to be added to WoT Blitz from the FV4005 Stage II line with a slight change in higher camo ratings but lower hull traverse by using the "Archer Early" tracks unlike the non-premium counter part having access to the "Archer Late" Tracks. Angry Connor is a weak armored and low HP target so it is recommended that players play far enough off that they may rain a constant barrage of shells onto the opponent while remaing unspotted. The tank has poor gun depression at only about 5° but a very wide arc of Gun Sweep; an open area is recommended for sniping in this tank. Due to the odd way of traveling through mean of driving backwards to reach top speed it is wise to use that for Peek-a-booming when an enemy is distracted so you may quickly withdrawal back to cover and harass repeatedly. This tank has a very exposed engine and it is not uncommon for it to break or to cause a fire with this being noted it is recommended the user carries two means of repairs or anti-fire materials. 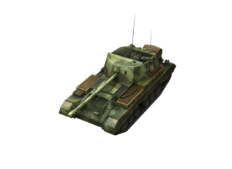 When facing mediums or lights at close range you can drive and turn faster than most tanks so long as the engine does not take any damage making it a very defensive TD. This page was last modified on 25 January 2017, at 16:50.